As predicted in an article in an American magazine, there was severe energy crisis in 1973. This led to several reports forecasting phasing out of the internal combustion engine and various alternatives were seriously considered for its replacement. The electric motor was considered an alternative, but due to its heavy structure, it was rejected. During that period, the traditional DC traction motor was only available and it was too heavy to satisfy the car owners accustomed to driving gasoline-powered cars. Although, the three-phase induction motor had a better power-to-mass ratio but that was mainly constant speed equipment and therefore, was also not considered suitable. In the 1960s power semiconductor equipment were introduced, which facilitated the use of the solid state Variable Speed Drive (VSD). The speed of a three-phase induction motor could then be changed by altering the frequency and the voltage. While the normal supply frequency in the US is 60Hz, in rest of the countries in the world, the frequency is 50Hz. A 60Hz two-pole motor rotates at around 3420 rpm on best possible load; whereas the corresponding speed for a four-pole motor is 1710 rpm. Similarly, for a 50 Hz motor the related speeds are 2850 rpm and 1425 rpm. The power-to-mass ratios of such motors are comparable to those of a high speed diesel engine In order to derive best possible power-to-mass ratios, one can opt for higher frequencies. The velocity of rotation of a motor with a specified number of poles is relative to the frequency. Higher frequency motors revolve at high speeds and thus have much better power-to-mass ratios. The electrical equipment in aircraft is designed to have ‘triple redundancy’ factor. In other words, three motors are required for the same specific job, any one of which must be capable of performing the tasks of the other two. With such strict conditions, mass and volume turn out to be very vital. 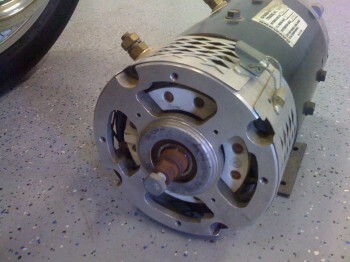 Motors and alternators utilized on aircraft normally operate therefore on a frequency of 400 Hz. Nevertheless, some aircrafts utilize 1200 Hz. Space and mass specifications are also crucial aspects for ships. The electrical systems on ships are usually run on 400Hz. While a 60 Hz motor with two pole-pairs revolves at 2840rpm and has a power-to mass ratio of 250 W/kg, a 400 Hz motor with two pole pairs rotate at 22,720 rpm and has a power-to-mass 2000W/kg. 1704rpm and 125W/kg for 60Hz and 11 360rpm and 1000W/kg for 400Hz. High frequency motors have small size and mass and for a specified electric power, their torque is much smaller than that of a low frequency motor. They compensate for it by rotating at proportionately high speeds. As the torque is lesser, the motor can be smaller and lighter. An aluminum frame motor and aluminum squirrel cage motor have, therefore, different parameters in terms of size and mass and frequency. It is clear from the analysis of the specifications of different type of electric motors that electrical motors compare satisfactorily with internal combustion engines in power-to-mass ratio. In addition, they are more compact, easier to assemble and do not need other supplementary equipment as in the case of an internal combustion engine, like radiator, exhaust system, starter motor, alternator, transmission etc. From the foregoing analysis, rapid technological developments in designing electric motors, ever rising prices of gasoline and increased awareness among people about emission of harmful gases by the internal combustion engine have made electric cars popular and many people are trying to convert their gasoline-powered cars into electric cars.